Nvidia continue to update their discrete laptop GPU range despite AMD and Intel teaming up to kick them out of the mobile GPU market. They quietly released new MX130 and MX110 discrete mobile GPUs during the launch of AMD’s Raven Ridge, and now, on the eve of Kaby Lake G, Nvidia have quietly let loose whispers of GTX 1050 and 1050 Ti Max-Q designs. Tired of turning your graphical settings to low? Here are the best graphics cards for gaming. 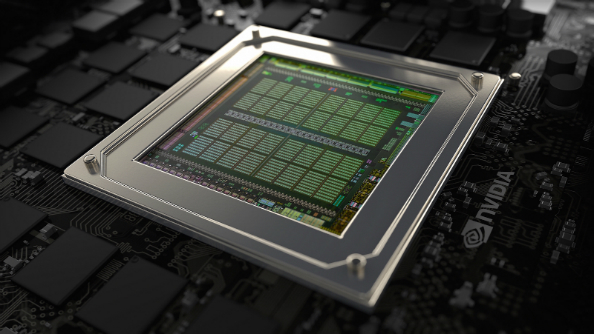 The news comes straight from Nvidia – not with a bang, but a whimper. This appeared intheir latest Linux drivers release notes, but Nvidia also confirmed to us at CES that they were preparing Max-Q designs of their GTX 1050 and 1050 Ti GPUs. 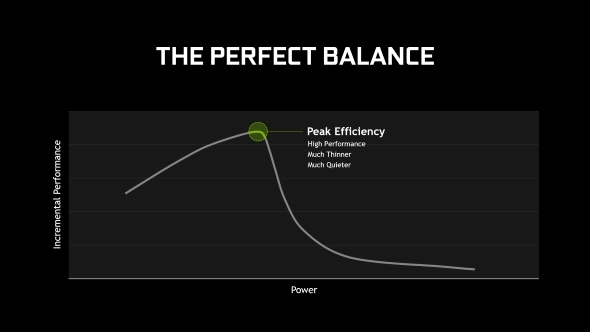 Nvidia list the specs of the two new Max-Q chips as follows: The GTX 1050 Ti Max-Q design features a TGP of 40 – 46W at 1.45x efficiency enhancement, 1151- 1290MHz base clock, and a 1290 – 1417 boost clock. The GTX 1050 Max-Q design features a TGP of 34 – 40W at 1.36x energy enhancement, a base clock of 999 – 1189MHz, and a boost clock of 1139 – 1328MHz. Both feature a target acoustic level at 40dBA, the same requirement across all Max-Q design GPUs. Nvidia have told us the GTX 1050 model is intended to be a somewhat easy replacement for the MX150 GPUs within the sort of slimline laptops the super low-spec discrete graphics silicon is currently calling home. It allows Nvidia to offer a little more graphical grunt in line with current laptop cooling and power-limited designs offered by OEMs. This could prove to be somewhat of a spanner in Intel’s mobile plans. This announcement from Nvidia (if you can even call it that) was made alongside the reveal of Intel’s Kaby Lake G – the hybrid AMD Vega M GL/GH powered chip. Intel are hoping this chip can dislodge the green team’s grip on the low-power mobile GPU space. Across Intel’s own benchmarks, the Vega M GL GPU’s performance has been competitive to the current mobile GTX 1050 chip. The GTX 1050 Ti Max-Q runs at cut-down clockspeeds compared to the current 1050 Ti mobile chip – to aid in power efficiency and noise. It could become a solid competitor for Intel’s Radeon graphics-enhanced chips – if performance doesn’t get entirely nerfed in the process – leaving manufacturers to choose between the two for their energy efficient slimline laptops. It seems Nvidia are managing to move the goalposts for Intel across the board, if only slightly, moments before kick-off. The GTX 1050 Max-Q seems to be a solid upgrade for previously MX150-powered laptops, threatening the market Intel are desperately attempting to push into. 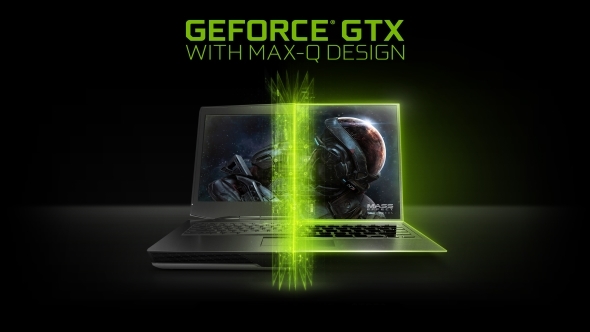 Laptop manufacturers love being able to offer discrete graphics cards in their laptops as upsold upgrades over machines that sport only integrated GPUs. Even if the discrete silicon isn’t quite as speedy as the integrated material, consumers’ minds are supposedly very slow to change. The GTX 1050 Ti Max-Q, on the other hand, still has a decent way to go if Nvidia intend for it to be competing anywhere close to the Vega M GH’s performance – at least according to Intel’s benchmarks. It’s possible the GTX 1050 Ti could compete with price/performance of Intel’s top-end chips, but this is all subjective to whether anybody releases any laptops with the 100W Vega M GH inside, and at what price.